fashion, eats and treats: OOTD: Happy Halloween! Happy Halloween, everyone! It used to be one of my favourite days back when I was a kid, although Singapore doesn't actually recognise it as a holiday >:( But I lived in a neighbourhood that always pulled out all the stops with the decorations, and there was always trick-or-treating going on, so I have pretty fond memories of October 31st. This year, I'm going to a friend's Halloween costume party, but here's something else more appropriate to wear out for the day itself. Of course, I went with all the tried-and-tested trends of all-black, lace and gothic jewellery, but don't you just love the overall effect? 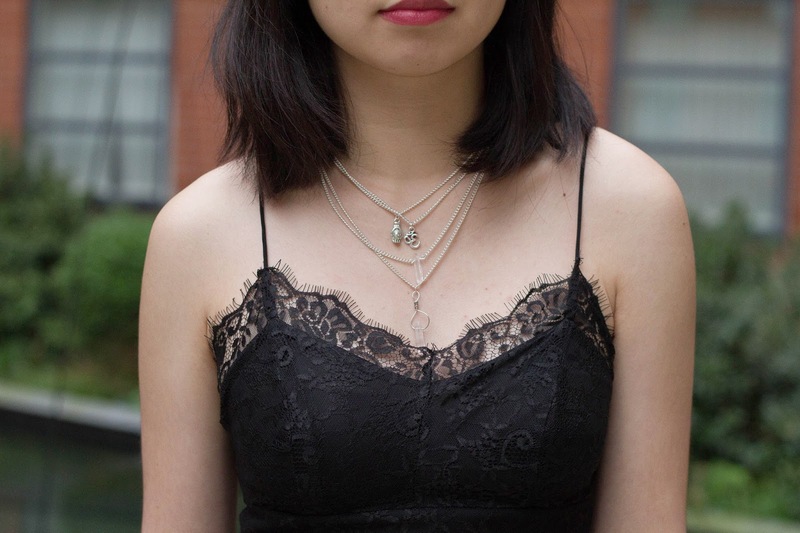 I especially love the accessories I paired with this outfit, they're so appropriately witchy (details below). I also invested in new make-up for the occasion, No. 7's matte lip crayon in Raspberry Wine. It's quite long-lasting and is basically a deeper shade of my natural lip colour, and only cost me £9!